Our American fire truck and crane flags are designed to be flown between fire truck ladders and on a crane arm respectively. Made of commercial grade 200 Denier nylon, these flags are light weight and quick drying and will make a dramatic display even in low wind conditions. Our American fire truck and crane flags are perfect for patriotic gatherings and events like fire safety week and awareness programs. 100% made in USA, these flags are offered in the popular sizes of 12’x18’,15’x25', 20’x30’, and 30’x60’. Shop right away and get the advantage of the best prices, quick shipping and much more! 100% customer satisfaction guaranteed! American fire truck and crane flags from Tuff flags are made to last long even in the most gruelling outdoor weather conditions. Made of premium quality 200 Denier fabric and finished with polysateen header and grommets, these quick drying flags and mildew resistant and while the Dupont Color-Fast dyes and the UV resistant treatment of the fabric will make these flags look brilliant and colourful for a long time even when used as a regular flag. 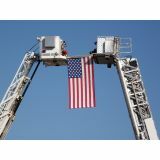 These commercial grade flags make a great way to show your patriotic pride for police and fire trucks. Light weight and durable, these flags will make a spectacular flag presentation even in light winds. Dyed with UV resistant Dupont ink, these flags will retain its beauty for a long time outdoors while the lock stitched fly end and horizontal edges will make these flags more wind resistant. Browse our complete line of American fire truck and crane flags to find a model that matches your needs. Should you need any help, please feel free to reach us at our toll free number 888-287-3524 or email at customercare@tuffflags.com and we will be happy to assist you.